This is a fairly perplexing problem for, and a problem that does not receive enough attention from, those who think that the economy is currently demand-constrained and not very supply-constrained. However, I’m not convinced. In the graph above, we see that openings have risen significantly since 2009, so Ashok’s logic is consistent. However, I think he may be too quick to discard the possibility that there has been a structural change in the way that employers advertise vacancies. In other words, the openings data error might be systematic, but not constant. Two recent papers, both by the wonderful UChicago professor Steven Davis along with Jason Faberman and John Haltiwanger, provide evidence for this hypothesis. 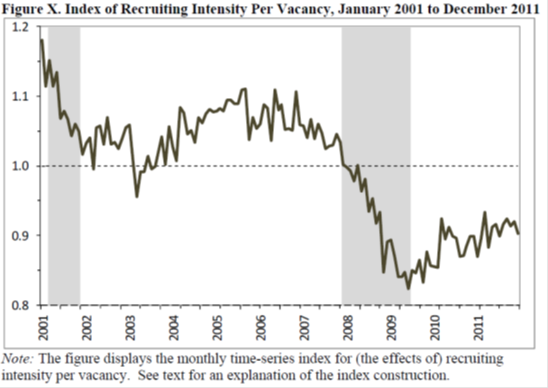 They argue that there is empirical evidence of a decline in “recruiting intensity” per job vacancy. The three build an index of recruiting intensity. From early 2007 to late 2009, it plummets by 20% and as of September 2011 remained significantly below the pre-recession trend. Thus, the number of vacancies has risen, but the effort employers put into sorting through possible hires has fallen. In short, the supply of able workers has not fallen; the demand for them has dropped, as evidenced by the drop in employer spending (of time and money) on recruiting. Employers are listing openings without intending to necessarily fill them. Intuitively, this is a result that makes sense to me. First, there is an ongoing secular decline in the cost of advertising job openings thanks to websites like Monster and CareerBuilder. This does not explain the sharp decline in 2008, though. Instead, I think the marginal benefit of posting a job vacancy probably rises during periods of mass unemployment (while the marginal cost stays the same). With a larger pool of possible hires, an employer has a greater chance of finding someone worth hiring. All else equal, an employer is more likely to post an opening if there is a larger supply of potential hires. I’ve made it this far without mentioning what I believe to be far and away the most convincing evidence that the labor market has few structural problems: wages remain depressed in all markets! A major implication of the claim that there is a skills mismatch in the labor market would be rising wages in supply-constrained fields. I have not seen any such data. Last, I know that there exists data on job openings from private online job boards (e.g. Monster.com). I, however, am unable to find it. It would be interesting to see how this data matches up with the JOLTS data. The recruiting intensity data is very interesting. 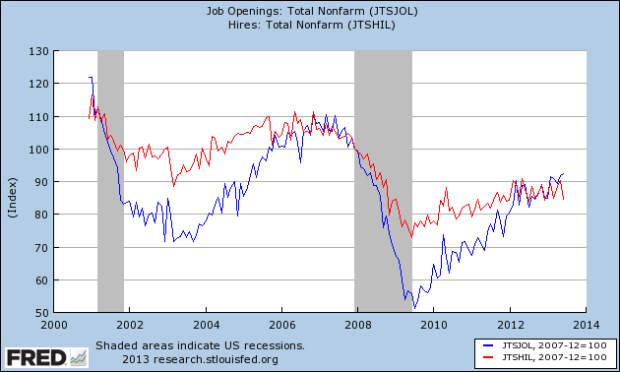 In fact, Peter Orszag considered this as an important possibility in a recent column (http://www.bloomberg.com/news/2013-08-13/with-so-many-job-openings-why-so-little-hiring-.html). My objection with using this data in particular to suggest the increase in openings is that you would expect intensity to fall in a recession. If anything, this bolsters the idea that the recent increase in openings imply more "demand" than previously with the sharp increase in intensity per vacancy since 2011. Also note the y-axis on the graph magnifies the variance by bounding it between 0.8 and 1.2. We've already recovered 90% of intensity losses, that sounds pretty good to me! Your point on not seeing supply-constrained wages increase is interesting. As I noted the AS-AD model seems to be limited in this particular consideration. However, I will note that many non-technological wages have seen below inflation pay rises over the past 20 years whereas programmers have seen above inflation rises over the past 20 years. This would support a constraint on important, skilled labor. 1. "you would expect intensity to fall in a recession"
I agree, but I don't see how this is a point in favor of the skills mismatch argument. If recruiting intensity falls, I think that would be equivalent to saying that the number of "effective openings" is lower than the data would otherwise suggest. That's a good point, however, I don't think your 90% estimate is accurate. More like 50% (the NBER paper states that from Dec 2007 to its trough, recruiting intensity falls 21%, and as of Sept 2011 remained 11% below). This was a point you made in your original post that I didn't and still don't follow. A skills mismatch is a supply shock, i.e. would be represented in AS-AD as the SRAS/LRAS curves shifting left, resulting in lower output and higher prices (which we don't see). I agree that there are important supply constraints in the labor market. However, as you note, many of these shortages (like that of programmers) have been around for many years. It doesn't seem like the shortage has seriously worsened in recent years. We'd expect to see increasing differentials in wage inflation across professions. I at least haven't seen data showing anything resembling this. There just aren't wage pressures in labor market.